I was wondering if you could recommend a good grapefruit scented line of body care that might be available to buy online. C, you could order the Grapefruit scented goods from Kiehl’s. They have a body wash and a body lotion, but I’ve tried both of these and neither of them smell overwhelmingly like Grapefruit. They’re sort of vaguely citrusy but if you don’t mind that and want a complete line, then give those products a try. The quality of Kiehl’s products is always excellent and their body lotions are nicely moisturizing. But there’s a better option. Because of your question, I discovered Fresh Hesperides Body Lotion which has grapefruit extract in it. You may be wondering how “grapefruit-y” this lotion actually is since it just has extract and it’s not called “Grapefruit Lotion”. Well it is very grapefruity. It smells exactly like Tropicana Grapefruit Juice which means that it smells delicious and fresh. The lotion is moisturizing but not overly heavy or greasy and absorbs quickly. If you’re looking for a citrus smell that’s different, this is definitely a product to order. I love that this lotion is named Hesperides. It’s so much more creative than the simple “Grapefruit Lotion”. The Hesperides are characters from Greek mythology – they were 3 nymphs who tended a garden that had a tree upon which magical apples grew. These apples were granted immortality to whoever ate them but the Hesperides kept picking the apples for themselves! Because of this, a dangerous dragon also guarded the nymphs, the tree, and the wondrous garden (sometimes also referred to as Hesperides as well) in which the apples grew. The nymphs themselves stand for the immortality-giving apples, so clearly Fresh is implying that its lotion will grant you immortality too! I love it! Doesn’t it make you want to use the lotion even more? 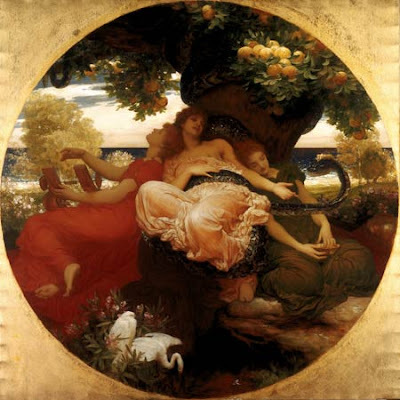 Painting by Frederic Leighton (1892) called The Garden of Hesperides.